How much will my gas mileage improve with the Unichip? Your normally aspirated, gasoline vehicle will produce more power and consume less fuel with the Unichip than without it, but how that changes average mileage depends on a number of variables including your right foot. Although possibly counter intuitive, your vehicle’s engine always uses the same amount of fuel to make a given amount of power unless it is somehow modified. What actually changes is how much power it makes and how long it makes that power. How much power it makes depends upon multiple variables like the engine’s condition, ambient environmental conditions, fuel grade, and accelerator position. How long it makes that power is determined solely by how long you keep the accelerator pushed down and what you ask it to do. If you’re not just driving to and from the corner market and do exactly the same thing, with the exact same vehicle, under exactly the same conditions with a correctly tuned Unichip, your vehicle will use less fuel that it does without the Unichip. A vehicle’s average mileage depends upon what governmental emission requirements that vehicle was designed to meet and how you use the vehicle. The engine is a surprisingly complex and sophisticated computer controlled machine and to understand why that machine does or does not deliver improved mileage, you have to understand how the system works. Basic engine design, governmental requirements, the OEM’s engineering solutions to meet those requirements, and how you drive the vehicle all impact mileage. The fuel mileage you observe is really the time averaged instantaneous mileage for everything the engine does. Starting, idling, accelerating, decelerating, steady state cruising all require different amounts of fuel to produce the different amount of power need to accomplish that task. The amount of fuel the engine uses to make a level of power is called Brake Specific Fuel Consumption. A given engine always consumes exactly the same amount of fuel to make a specific amount of power for a specific amount of time. A given engine may have different a BSFC at a different power levels. A given engine has only one “peak” BSFC which corresponds to the lowest mathematical ratio; that is the lowest fuel used to produce the most power. Every other BSFC is worse than that peak value for that engine. A given engine consumes the same amount of fuel under all conditions. If you ask the engine to make more power or make the same amount of power for a longer time without modifying it, it uses more fuel. If you ask it to make less power or make the same amount of power for a shorter time without modifying it, it uses less fuel. One BSFC is “ideal.” Every road engine is a compromise intended to provide a good average across a number of requirements. A particular engine’s BSFC for idea power is different from that same engine’s minimum fuel consumption BSFC, which is probably different from its minimum emissions BSFC. Virtually all production road vehicle engines are set richer than optimum under Open Loop conditions and can be leaned out to yield a smaller that is changed to as to use less fuel to make the same amount of power BSFC value. The only way to change an engine’s BSFC at a specific power level is to physically modify the engine (raise the compression, add a supercharger, modify the ECU, etc…). Everyone knows their vehicle’s mileage changes from one tank to another. Since BSFC doesn’t change unless the engine is modified, something else must be causing the mileage change. That something isn’t the engine compartment, or in the ECU, it’s in the mirror. What you do with your vehicle changes how much power you ask from the engine and how long it makes that power. Were you driving with the air conditioning on one trip and off on another? Was the vehicle weighed down with a heavy load on the first trip and empty on the second? Were you well above the speed limit on one but at the limit at the other? Were you slugging through two feet of snow on the first test and on a sunny spring day on the second? The time average of instantaneous BSFC for a particular engine is what you see as for average fuel economy. If an engine of fixed design and control maps has to work at high power levels it operates at a higher BSFC and will deliver lower economy. If it has to work at low power levels it operates at lower BSFC and will deliver higher economy. Every time you drive, you command a different power level for a different amount of time which means that every trip is an average of a unique set of instantaneous BSFC’s. Emissions reduction – The second factor affecting fuel mileage has nothing to do with basic engine operation, but is an artificial requirement imposed by society on all gasoline Otto-cycle engines that are road legal to minimize exhaust emissions. As a society, we decided reducing pollution is a major consideration and have implemented requirements for street vehicles such that they spend most of their operating time at in an environmentally friendly mode. In the 1996 the Federal Government mandated all vehicles intended for street use meet OBD2 standards which include emissions requirements that all OEM’s must meet including mandatory stoichiometric emissions for most driving conditions. While BSFC is viable engineering concept, a closely related measurement is much more easily measurable that is more commonly talked about is Air-to-Fuel Ratio, or AFR. While BSFC expresses fuel consumption relative to power, it’s difficult to measure without a dynamometer but AFR can be measured directly from the engine exhaust. Rather than expressing fuel consumption relative to power, AFR expresses fuel consumption as a by product of the chemical reaction within the combustion chamber a less precise measurement but much easier to obtain. The amount of fuel injected relative to the amount of air entering the engine determines the nature of the chemical reaction within the combustion chamber and as with any chemical reaction when reactive material quantities vary, the reaction changes. Measuring the ratio of the exhaust determines the nature of the combustion and is expressed in AFR. The most chemically complete reaction, that is the one in which the fuel is most completely consumed, it called the stoichiometric ratio. Although the precise ratio varies with the additives in the fuel, the generally accepted stoichiometric ratio for a gasoline engine is 14.7 – 1 that is for every 14.7 units of air by mass the engine should use 1 unit by mass of fuel. Otto-cycle engine’s can operate over a fairly wide AFR band between roughly 8.0 and 18.0 but they pretty consistently exhibit specific characteristics at specific AFR’s. The stoichiometric ratio produces the most chemically complete reaction which produces the lowest chemical “pollution” value; however, the engine is rarely most powerful or most economical at the stoichiometric ratio. Engines typically produce more power at an AFR richer than the stoichiometric ratio. Normally aspirated Otto-cycle engines typically make their best sustainable power at approximately 13.0 – 1. A specific engine design may vary slightly from that general number, but in all cases running richer or leaner than that engine design’s optimum power AFR causes a reduction in power. In all cases, an engine operating at it’s optimum power AFR produces more emissions than that same engine operating at the stoichiometric ratio. Engines typically consume far less fuel at an AFR leaner than the stoichiometric ratio. Most normally aspirated Otto-cycle engines typically consume the least fuel at approximately 15.5 – 1 AFR. A specific engine design may vary slightly from that general number, but in all cases running richer than that engine design’s optimum economy AFR causes an increase in fuel consumption. Running an engine leaner than it’s optimum economy AFR causes the engine to lose so much power that it can no longer produce the required power and the vehicle will either slow of more fuel is required to continue which obviously increases fuel consumption. In all cases, and engine operating at its optimum economy AFR produces more emissions than that same engine operating at it’s stoichiometric ratio. Engine Load is the term for how much air the engine is processing and is the only factor used to determine which fuel control zone is used. At low load the engine is in closed loop regardless of rpm. At high load, the engine is in open loop regardless of rpm. Generally using 50% load as the dividing line is a reason able approximation but the actual transition point can be seen with a scan tool. An open loop control scheme is one in which there is no performance feedback to modify command control. An example of open loop control is to imagine a blindfolded shooter on a target range. The shooter can point the weapon and can fire off rounds, but can’t see where the rounds go relative to the target. Without the feedback of seeing where the rounds are missing, the shooter has no way to improve his performance. In automotive engine control, Open Loop is used because (1) the exhaust velocity through the catalytic converters is too fast for any meaningful chemical reaction to occur so emissions control is a moot issue and (2) wide band O2 sensors would be necessary to be responsive in both the AFR’s desired for emissions and those necessary for good power production and those sensors have been traditionally expensive which would drive up vehicle cost. In Open Loop, a vehicle’s ECU uses look up data with no feedback to control the engine it has no feedback to improve performance, just like the blindfolded target shooter. A closed loop control scheme is one in which some type of performance feedback is used to modify command control to achieve a desired result. Using the target shooter analogy from above, now the shooter’s blindfold is removed and they are free to see where the rounds are going and use that feedback to improve their performance… that is to get closer to the center of the target. In closed loop, an oxygen sensor located in the exhaust pipe provide feedback to the ECU allowing the ECU to self adjust it control commands to achieve a stoichiometric ratio. Feedback from the O2 sensors tell the ECU whether the engine is richer or leaner than stoichiometric so that it can modify it’s control commands to improve it’s performance… that is get closer to ideal stoichiometric. To ensure OBD2 compliance as the engine’s components begin wearing our, all OEM&’s engineer an adaptation scheme into their closed loop control systems – this adaptation is often referred to learning. Consider the AFR implications of worn fuel injectors. The injectors are spring closed, electrically opened valves that function once every two rotations of the engine’s crankshaft. When it’s brand new, the spring is nice and strong and the injector opens pretty slowly and closes pretty quickly because of that strong spring. If you drive for an hour at 3,000 rpm, each injector in your engine opens and closed 90,000 time…consider the relative strength of that spring after two years of normal use. The spring is much weaker and, therefore, the injector opens quicker and closes slower which increases the amount of time the injector is open and therefore the amount of fuel being injected. To be legal for sale in the US, an Otto-cycle engine’s ECU must automatically adapt to maintain a stoichiometric ratio or must illuminate a Check Engine Light (CEL) whenever it can not maintain that ratio. In the example above, the OEM ECU must detect the fact the engine is becoming progressively richer and react to counter that change. In this case, the ECU will reduce the injector duty cycle to reduce the AFR back to stoichiometric. This adaptation can be observed in percentage of fuel change with a scan tool by looking at the Long Term Fuel Trims (LTFT). The correct terminology for ECU’s feedback modified control commands is adaptation and in OBD2 vehicles the adaptation can be seen with a scan tool as Long Term Fuel Trims. Although the exact boundaries vary slightly by vehicle type, all OBD2 vehicles adapt. They all adapt through virtually identical schemes, with virtually identical adaptation limits, and at very similar response times. The limit for most is + 25%; if the exhaust returns to stoichiometric within the limit, the vehicle continues normal operation. If the vehicle reaches the adaptation limit and the exhaust does not reach stoichiometric, the CEL illuminates with a corresponding Digital Trouble Code indicating whether the engine is running too rich or too lean. With the CEL illuminated, the vehicle will not pass an emissions check thus making the vehicle OBD2 compliant. Although Long Term Fuel Trims (adaptations) are changes to how much fuel the engine is uses, they have little impact on fuel mileage because the corrections are all “back to” factory desired values. If a vehicle has a positive LTFT, the added fuel is needed to correct the fact that the engine is running too lean on it’s uncorrected command controls. The LTFT correction, therefore, has no overall effect on mileage. LTFT’s can, however, have a major impact on Open Loop performance and power production if not properly accounted for by an after market engine management system. We always account for LTFT’s when building our performance maps. The Unichip does work in Closed Loop, and is designed to eliminate LTFT’s created by the bolt-on components installed on your vehicle. The Unichip integration scheme means whenever you’re ‘getting groceries” and driving with light load, your vehicle drives exactly like it was designed to… including graceful adaptation as the miles add up. While the Unichip is working in Closed Loop, that work is for efficiency and emissions not power… in Closed Loop, if you want more power you push the accelerator down further. Power tuning happens in Open Loop where there you can’t push the accelerator down any more. In Open Loop for your normally aspirated Otto-cycle engine, the Unichip is tuned for power which means we command less fuel for a given amount of air than the factory ECU wants to use (in addition to adding ignition timing). That means better BSFC and increased power with the Unichip than without it. So what does all that mean to your mileage? 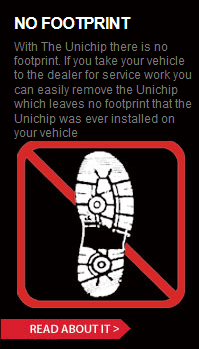 During Closed Loop driving with the Unichip, you’ll get exactly the same mileage as you do without the Unichip since even with the Unichip installed all normal adaptation is functioning exactly as you want. If you think you had an “ah” moment while reading you’ll get the same mileage in light throttle driving, and that another product does something “better” than the Unichip in Closed Loop, you’re missing something. Unichip Closed Loop tuning is very deliberate and does exactly what should be done and there is no other product that performs better during light load driving… even if somebody says or claims they do. Before pushing the vehicle hard, let’s do a warm up lap at 30% throttle which is in Closed Loop. The lap takes two minutes and takes 0.1 gallons of fuel. For argument’s sake, when you push it, let’s assume you can turn a lap in 1 minute at full throttle in your stock vehicle. Just to pick a number, let’s assume doing so consumes 0.5 gallons of fuel. Now let’s come into the pits and install a Unichip. Keeping all other variables – the vehicle, track, and weather – unchanged, let’s go back out and do another 1 minute lap which is the same lap time you did in the stock vehicle. Although the lap time remains the same, what changes is that you are no longer at full throttle because the engine makes more power. You’ll also find that the one minute lap now requires a bit under 0.4 gallons of fuel which is quite a bit less than it took stock. Same amount of work with better mileage because of the improved BSFC with the Unichip. On the next lap, let’s press the accelerator a little further but still not quite to the floor. On this lap, you’ll find that the vehicle once again consumes 0.5 gallons of fuel just like it did without the Unichip, but now the lap only took 58 seconds. Same mileage but increased work accomplished because of the improved BSFC with the Unichip. Now the lap takes only 56 seconds, but you find the lap takes 0.55 gallons of fuel. Same throttle position with decreased mileage but MUCH increased work because of the improved power and BSFC with the Unichip. Now let’s do a cool down lap that matches the warm up lap we did at the beginning… you’ll find that the 30% throttle lap once again takes two minutes and 0.1 gallons of fuel which is the same as it did without the Unichip installed. Closed loop performance remains unchanged because the Unichip is carefully integrated to enable all factory adaptation to function as designed. Your average mileage change depends upon how you combine the above scenarios. It doesn’t have to be on a race track… 65-70 mph highway driving on cruise control will see your engine jumping between Open and Closed Loop. Every time you go up hill, or drive into a headwind, or haul something, or accelerate to pass another vehicle, the engine goes into open loop. Which one of the scenarios it goes into depends upon what you ask the vehicle to do… you can get increase mileage at the same power, a smaller increase in power at the same mileage, or a larger increase in power at worse mileage. Whenever you aren’t doing one of those sorts of things, the engine will be in Closed Loop and will be delivering the same mileage. On any given trip, the amount of time your engine is in Closed Loop, the amount of time your engine is in Open Loop… and while in Open Loop, the balance of power vs. mileage you command with your foot… all combine to yield your average mileage. If you do everything exactly the same, and you’re not just driving to the corner to get milk, you should see a mileage improvement. Practically speaking, on some trips, mileage will go up, on some trips it will be unchanged, and on others still it may decrease slightly… but on each, what happens is up to you and your foot.